Santorini or Thira as it is otherwise named, is one of the most beautiful and unique islands in Greece and the world. 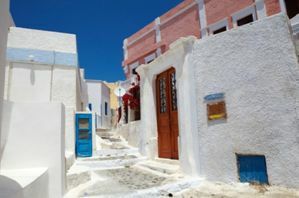 Located in the South Aegean sea and part of the Cyclades Islands. 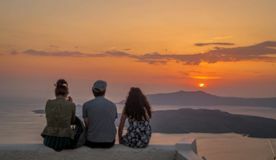 Intriguing history, awesome volcanic landscape, cosmopolitan atmosphere, breathtaking sunsets, deep blue sea, the volcano, are just some of the reasons that make Santorini the most popular holiday destination in Greece!! 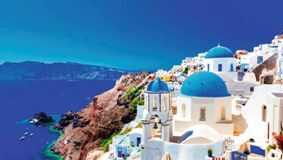 Santorini has a metaphysical energy that becomes you as you sail into the Caldera rim and gaze up the steep cliffs. Fira, Oia, Imerovigli are just some of the villages that are built into the cliffs with magnificent view of the Aegean sea, the volcano and the nearby islands of Ios, Folegandros and Sikinos.Santorini is a unique island in Greece. But for the majority of us that will visit Santorini only for a few days, let’s see the 10 best things to do in Santorini, that will make your stay on this unique island truly memorable! Walking on the black lava of an active volcano. It sounds fascinating, isn’t it? 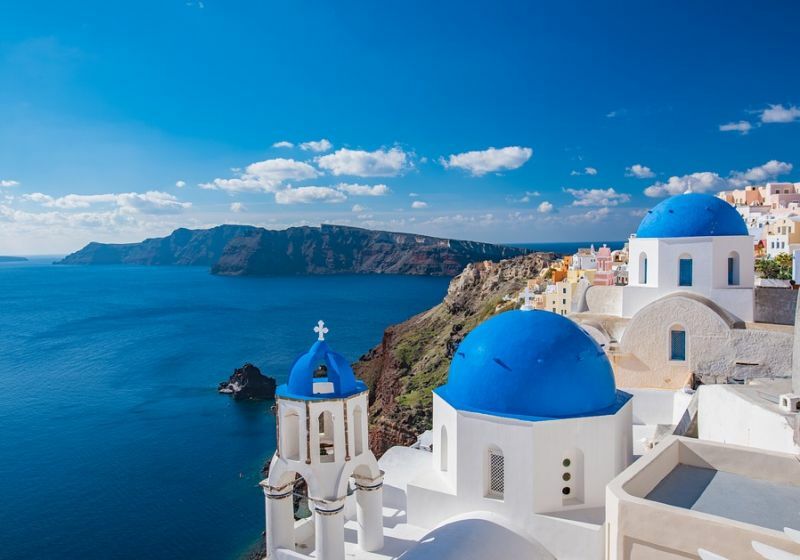 Just think that the eruption of the volcano back in 1600 BC, sank half of the ancient Santorini and created two volcanic islands made of frozen lava, that can be visited on a day cruise. Walk the rough path to the top of “Nea Kameni” and admire the lunar landscape of this barren island. Here and there, steam is coming out of the burnt rocks. We said volcano is active, didn’t we? The next big eruption will be… well not so soon, don’t worry. And if you want another proof of the volcanic activity, swim at the “Hot Springs”, a small bay in the second volcanic island “Palaia Kameni”, where water’s temperature is 30 Celsius. 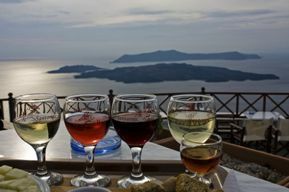 If you think that Santorini is only the cosmopolitan and touristic destination of present, you are wrong. The island has a rich history dated back to 3000 BC. Destroyed from the volcanic eruption, the ancient town of Akrotiri was discovered in 1967 and is open to the public. 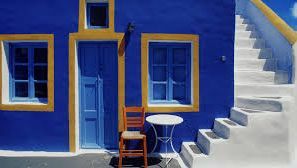 Although the famous wall paintings that were found in Akrotiri are exhibited in Athens, you can still admire the sophisticated architecture and the three storey houses. Another ancient town is “Ancient Thera”, dated from 9th century BC and located 360 meters high above sea level. It was an important settlement in the Hellenistic and Roman times and was excavated in 1895. The ruins may not be so impressive, but the view is truly amazing. 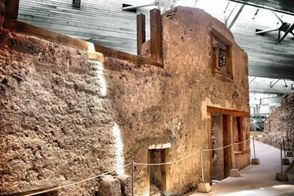 Artifacts from both towns can be seen at the museums of Fira town (Archaeological and Prehistoric). It sounds expensive? 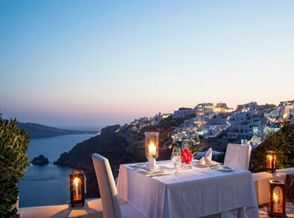 Well not that much, having in mind that generally Santorini is not a low cost destination. You could save some money and make to yourself a great gift: Enjoy the bright Greek sun and cool yourself in your private pool, while your partner is sunbathing in your private terrace. Not much private, you will argue? Fair enough, if you choose to stay in the caldera where privacy is relative. But there are hidden gems, such as “Anema Residence private villas” (http://www.anema-santorini.com/ ) where you will relax in a peaceful environment away from the hassle and crowds of the touristic paths. Not the easiest way to go from Fira to Oia, but surely the most scenic one. 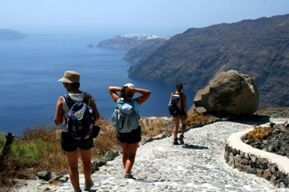 Leave your car/motorbike at your hotel, wear your sports clothes and shoes and imitate the residents of the past that walked on the cliffside to reach the northern village of the island. You will admire the great view of the caldera and the sea below your feet and see the landscape of Santorini in another perspective, away from the busy car roads. Trail is 9kms long, so start your adventure early in the morning or late in the afternoon. You already know Fira and Oia. But have you heard of Pyrgos, Megalochori and Emborio? These hidden medieval villages, once unknown to tourists, are recently discovered and developed. Old fortresses of the Venecian era, they hide inside their stone walls beautiful houses, narrow streets, hundred churches and traditional taverns and “kafeneia”, the old style Greek cafes. One more “ouzo” please! Day or Sunset, Lagoon or Tahiti boat, departing from Vlychada or Ammoudi. Either way, just book it! A caldera cruise with a luxurious catamaran is something to remember. Dive from the boat in the crystal water, enjoy a barbeque meal on the boat or in a small pebble beach of the volcanic islands, admire the cliffs high above your head, and watch the sun goes down in the sea horizon just in front of you… No wonder that the catamaran cruise evolves into the most popular Santorini excursion. Thus, do not wait until last moment to book your seat, boats may be full! History, museums, romance, food and wine... But what about fun? Santorini is after all an island, a mostly summer destination! Although not famous for its beaches, you will still cool yourself in the blue sea and get the tan that you wish under the hot summer sun. The black sandy beaches of Perivolos and Kamari are the most popular ones, and they are full of sun beds, water sports, beach bars, restaurants and hotels. Red beach and White beach have more difficult access, while smaller beaches like Kouloumbos, Pori, Baxedes, Vourvoulos are ideal for those who do not like the big crowds.